Oops, I made a change to my page and it doesn't look right. How do I revert back to a previous version? Under the Snapshot (bottom right) you will see a button "View Past Versions"
5. You will now see every version of your page where you can Preview (to ensure it's the working one) and Restore Page to bring it back to life. 6. 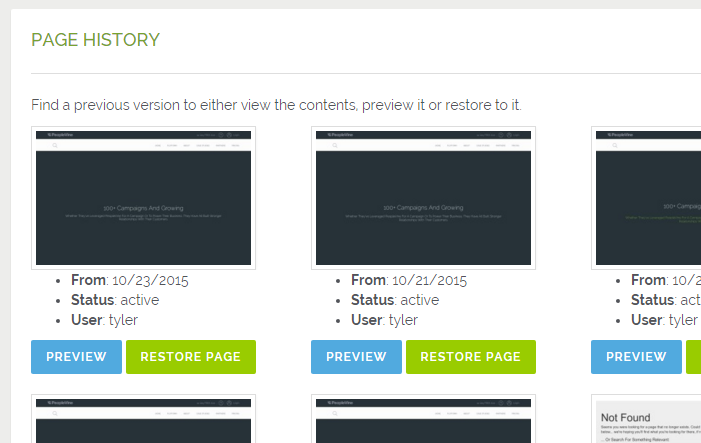 If you click on Restore Page, you will need to confirm everything is accurate before reverting back. Please note that when reverting back you are going back to the original title, content, layout, keyword, meta tags, settings, etc. so look it over just to make sure.